Chapter 01: Can You Help? Introduction » Kharag Monastery Campaign » Episode 16: Crypt of the Devil Lich » Chapter 01: Can You Help? The party have said goodbye to Ariel who is off looking for adventure more to her liking. The remainder are all currently at Trina. It is mid morning. There is somewhat of a commotion outside: voices, trying to get attention. "What's happening outside?" Troll asks Trina. "There are some elves gathered outside my bramble." "No good comes from elves. What are they doing?" "They are seeking your attention." "Are we able to communicate with them, without going outside?" "I can arrange that if you wish." "That would be good. I don't trust elves." "One of them is known to me: a wizard from Avarriel who comes this way." "Ah. From Avarriel. Just a minute." Troll seeks Ethalyn. "Yes, dear?" Ethalyn says, looking up from her piles of parchment. "There are some people on the outside, happened to knock on the door. One of them is a wizard from Avarriel. An elf. Have you heard of … I'm sorry, I actually don't know his name. Trina? What's his name? Trina?" Troll has heard of Hagolel. He is one of the wizards that has a growing relationship with the Spiderkillers. He is often called upon to Teleport people to and from the capital city. Troll seeks and finds Rowaine and tells her what is going on (because he gets in trouble if he doesn't). "There are some people outside, sounds as if they want to chat. I thought we'd go out and find out what they want." "How many are there, Trina?" "Not really a fair fight, with two of us, but anyway…"
Troll and Rowaine make their way through the brambles and see Hagolel. "Etella! It is a pleasure to see you again. I come directly from the capital. I bring these two esteemed gentlemen with me. May I introduce Evestel and Tristo. They are from a town called Arovarel. They came to Avarriel seeking our help. They secured an audience with the Queen, who suggested that their matter might be of interest and might be better dealt with by yourself and your party." Hagolel passes Troll a sealed scroll written in the Queen's hand that corroborates his words. "Would you like to come in?" Troll asks. Troll leads the visitors inside the bramble and to Abbey's tent. "Wait here. Abbey, tea for everyone." He then gathers the other members of the party. Evestel then begins to talk. "I bring grave news from what is now the borderlands of the elven kingdom. You may not know of Arovarel, but it once was a great city. Nearly a thousand years ago Arovarel fell under a dark shadow from beneath and was attacked both from beneath and from the outside by a fearsome, horrible sorceress devil lich by the name of Chalychia. The city fell within a single day and became a beacon for evil for a year before the evil was finally quelled by a party of adventurers and by the combined might of the elves, dwarves from Minehome and the humans of Holt. The devil-lich herself was slain and a monastery was established near the site to ever keep vigil. Of late, we have been reading signs in the stars that the time approaches when the devil-lich stirs again. Arovarel now is only a small town; we number less than fifty. We sent a half-dozen of our warriors to check in with the monastery. They have not returned. And so we have come, first to Avarriel to seek help. We are few, and most of our best warriors are now lost. Would you aid us again?" "Well," Troll says, "We dwarves are happy to help." Evestel looks confused. "Oh, these others are not dwarves. Just me and her," Troll says, indicating Rowaine. This does nothing to lessen the elf's confusion. "Excuse Troll," Rowaine says. We were raised as dwarves in a good dwarven community that takes in orphans of all races. Praise to the All-Father." "I now understand. You both speak with accented tongues." "No, I speak normally," Troll says. "It's the rest of you." "I throw myself upon your mercy. Would you please help?" "How can we in all good conscience turn away from people in need?" "Because we have so much on our plate… Oh, sorry, rhetorical question?" Troll turns to Evestel. "OK. We're in. The others can of course decide for themselves whether they would like to join in on this quest, or stay home and do their nails." "It could be dangerous, we could all lose our lives, but it is in the service of a greater good," Rowaine says, not overly helpfully. "How can you say no?" "Oh, it's really easy," Troll says, even less helpfully. "Let me show you: no. I'm not actually saying it, but, you know? Oh, sorry, rhetorical." "The decision is clear to all of good conscience," Rowaine says. The others agree. "I am very grateful," Evestel says. "I wish I could help you more, but all I am able to offer you is guidance to our town. I can leave whenever you are ready." The arcanite teachers are not expecting to see Troll again for something approaching two weeks. "Now isn't a bad time, I suppose… How long to get to wherever it is you are from? Blah blah, elven town." Evestel shows Troll a map. 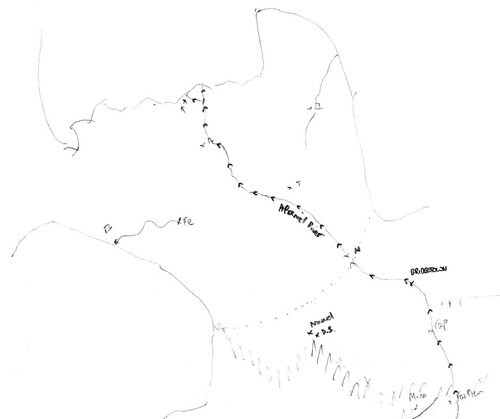 "About three and a half days walk. Arovarel is here, almost due south of where we are. It is near the same mountain range that Minehome is in, to the southeast." The party examine the map. Travel from Kharag Monastery is about as far as travel from Trina. Elondel is closer, but is also on the wrong side of the mountains. "How long ago since your warriors were dispatched?" Rowaine asks. "They went missing and were overdue six days ago." "And how far is it from Arovarel to this monastery?" "It is but an hour away." "We can Teleport there, right?" Troll asks. It is not a guaranteed trip. Hagolel knows of Arovarel and has heard something of the monastery nearby but has never been there. After playing with the idea of getting Saju to probe Evestel's memories for the purposes of a safer Teleport, Rowaine points out the plan's dubious ethics. The party opt for Disc Protocol 1, a two-day journey. The party prepare and depart, taking Evestel and Tristo with them. On the way, the elves speak of their home's history. Legend tells of the horrible drow sorceress Chalychia. Born of a drow father and a demon mother, she rose to become one of the greatest drow conquerors ever known. She recovered a powerful artifact called the Shadowstone, and used its abilities to cover a five-mile radius of the surface world in constant twilight, centered on the elven city of Arovarel. With allied orc armies attacking from the mountains, and drow armies swarming up from beneath, the elven city fell in a single day. At the head of this horrible army was Chalychia. But Chalychia's rule lasted only one year. 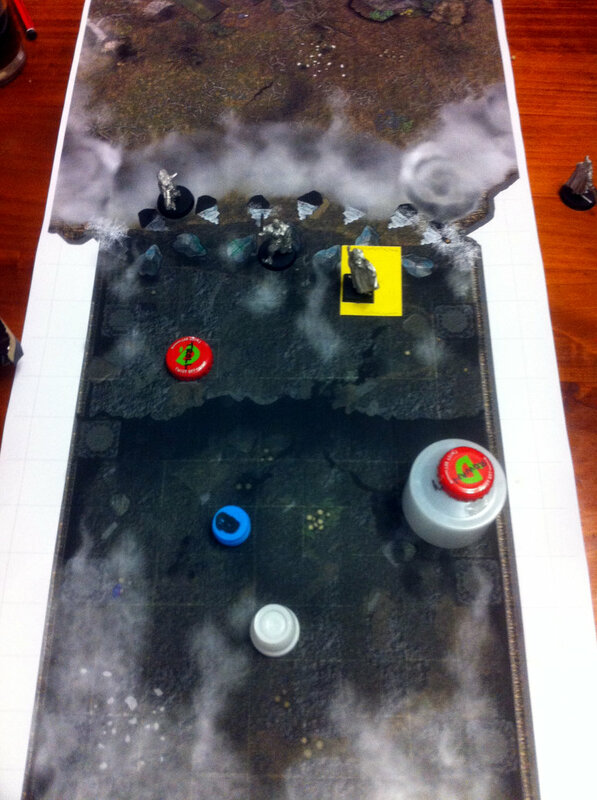 A band of powerful heroes led by the paladin Valinus penetrated her lair and destroyed the Shadowstone. Meanwhile, the rallied forces of humans, dwarves, and elves stormed the ruins of Arovarel and routed the drow. The heroes used a powerful sword to defeat Chalychia, but it was sundered in the battle. The heroes finally imprisoned Chalychia in an Instant Fortress in the bowels of her lair. The sundered sword was buried in her lair, the lair was sealed, and a monastery was erected near the site. The Monks of the Dawning Sun were charged with guarding the sundered sword and the lair, and were to be the lore masters of the history of Chalychia. Now descendants of Arovarel's survivors have called for your aid. They have seen many disturbing omens recently. According to the stars, the Devil-Lich is close to breaking out of her prison and unleashing her wrath on the surface world once again. After two days the party reach Arovarel. It is a very small town. Even nearly a thousand years of history has not erased the scars of the former city's destruction. "The monastery is but an hour's walk that way," Evestel says. "You can't miss it. I wish you fleet and silent feet. The blessings of Corellon Larethian and the gods that you serve be upon you." "Moradin be with you," Troll answers. The party head off down the trail, staying on foot except for Calico and Violet who maintain avian form. Lionel takes the lead and Harley and Rowaine stay in the rear. A little over half an hour into the walk the two birds can see what must be the monastery: a single building next to the trail. A figure exits via the front door and rounds the corner out of sight. It could be a dwarf. Violet returns to the others, assumes gnome form and tells Rowaine what is ahead. "Dwarves are trustworthy," Troll says. "Good thing it wasn't an elf or we'd have to kill it." "Are you sure it was a dwarf?" Rowaine asks. "Faking being a dwarf?" Troll says. "Sacrilege!" "People could say the same of you…"
"I don't think you should be using my own words against me, that's unfair." "Nothing we've heard suggests that it is specifically a dwarven monastery," Rowaine continues. "They didn't say." "We just know that somebody is out there," Troll says. "But we were going to be a bit careful anyway, right?" "I would expect there to be somebody there…"
The party continue on, Violet on her flying carpet. It is not long before the monastery comes into view. The door is closed, there is no one in sight. Calico circles the building, seeing no one. There is another door at the monastery's rear. He descends to window height and looks inside on a low-speed pass. Inside, he sees the same figure, definitely a dwarf, crouching down over somebody else. Calico returns to Rowaine but cannot get his message across. "Troll, can you Telepathic Bond this bird?" asks Rowaine. Troll obliges, connecting the entire party. "There is a dwarf inside, crouching over another person," Calico thinks. The front door opens and a dwarf comes out, a spade in his hand. He spots the party, thrusts the spade into the earth, then looses a mace strapped to his back. "Who be ye?" he says in common. "Hi, I'm Troll," comes the reply, in perfect dwarven. "And what brings you to all to this place?" His eyes fall on the stone flyer, then the armoured woman mounted on it, then the heraldry on the woman's breastplate. He pauses. "Tall for a paladin of Moradin… Lady Rowaine?" "Yes. How is it you know my name?" "I have heard of your deeds. They go before you. They speak well of you, young woman. Well met, if these are yours?" "They are indeed, some more than others." "Perhaps I can call upon your assistance," the dwarf says. "There has happened here a deed most foul and I must say tragic. These good elves, these followers of Sehanine, have been slaughtered like animals! I would request your assistance in giving them good rest." "But of course, good dwarf," Rowaine replies. "You have help. Is this place secure? Are we safe?" "I find nothing living here. And by the blood that has been spilt, there has been nothing living here for nearly a week. It looks like the work of one assailant who went from victim to victim. The perpetrator left humanoid, bare footprints. "May I ask what brings you here?" Lionel asks the dwarf. "My assistance was requested by the elders of the village of Arovarel, under the treaty." "What is your name?" Violet asks. "Good question, my dear gnome. I am Breg." Breg turns to Troll. "You would be Troll, then, from the stories? Troll the … dwarf?" "A dwarf is made by his acts, not his parenting." "Yes!" Troll says. "Rowaine has got a really good axe." "A sense of humour, too. Useful in times like these… I find myself at a loss for words. Although, it seems our villain did not. There are messages. You may see for yourself on the walls inside. I will begin preparations," he says, glancing at Rowaine. Rowaine waits behind while the others enter the monastery. Breg leaves his spade behind and starts walking. "Their faith dictates that their dead are committed to the ground by burial, or to the air by pyre." Rowaine nods. Together, solemnly, they start gathering dry wood. Inside the monastery, the others are assaulted by the stench of long-dead, nibbled-upon flesh. The single building is divided into a dual-purpose kitchen and dining area, a place for prayer open to the elements, a room with spartan sleeping cots and a library. Scrawled upon several of the walls in blood dried black are several prophetic verses proclaiming that Chalychia's return is soon. In the library are several tomes opened to similar passages, all describing the powerful sword called True Death: the sword used by the paladin Valinus to slay Chalychia. According to the legends here penned, its sundered remains were buried in the Devil-Lich's crypt. It appears that something else has been researching True Death. There is a ripped-out page on the floor: a drawing of a sword, shattered into six pieces. Also inside, the party find a blood-stained map showing the way to the original site of the Devil-Lich's crypt. There are fifteen bodies inside the monastery. Six of them were not monks, obvious by their armour and weapons. Together, Breg and the party gather the remains and place them atop a pyre of oil-soaked wood. Breg turns to Troll. "You, sir, are a master of the arcane?" "I like that title!" Troll replies. "Troll, Master of the Arcane. Yes! I am." "The people of this place honour their god in death by consigning their remains to fire." Breg looks down in prayer: "Marthammor Duin convey these people's souls to their god. May you help them find their way that they may not be lost but find the home that is their place." He then nods towards Troll. A Fiery Burst sees the deed done. Everyone is silent as the departed are bid farewell on their final journey. After a time, Breg speaks. "I was sent here by a request under the treaty that united dwarves and elves and humans. I intend to investigate and take appropriate measures. Justice must be done. These priests, while they followed another god, did not deserve this. I see before me dwarves and elves and humans. You would be welcome to accompany me." "We will stand by your side," Rowaine says for them all. "Tell me about that map," Troll says. "Interestingly," Breg says, "It lines up very well with those bloody footprints that lead that way, towards the mountains." "Let's follow the footprints," Lionel says flatly. "That's a good idea," Troll replies. "Because we need to find this person and ask them what happened here." The group start stalking purposefully down the blood-stained trail that turns into a narrow mountain path. After almost two hours of a journey that is both treacherous and tedious, the group arrive at a cave entrance, the mouth of which is surrounded by stalactites and stalagmites that appear to have been chiselled into angular teeth. The tracks lead directly inside. The cavern cuts deep into the side of the mountain. Between the stalactites, thin tentrils of oily smoke curl skywards. Twisted shadows dance along the walls as light flickers from torches set into large skeletal braces that reinforce the walls of the cavern. An elaborate mosaic comprised of dyed chips of bone and ceramic covers the walls. The mosaic depicts horrendous atrocities and terrible battles over the centuries. Breg deduces that the tracks stop at the mouth of the cavern, then disappear. Inside is a bent humanoid figure, roaming around. It appears to be a gaunt human, wearing torn, bloodied robes. "You there!" Breg says. "Who are you?" "Hmmm! Ack! Get out! Get out! Why do you come here? Do you seek the power that lies in the Devil-Lich's crypt for yourself? Or do you seek to destroy it? You are fools either way, for the dangers are great. You must prove yourself, to me, to the Crypt, to Chalychia herself! For only heroes of great mettle could dare confront the Devil-Lich. Curse her! CURSE HER!" "Lady paladin," Breg says to Rowaine, "can you tell this creature's character?" "I will have to get closer." "Ah, well, come with me!" Initiative: Troll, Lionel, Violet, Rowaine, Calico, Monster, Breg. Troll casts Invisibility Sphere: all but Calico and Breg become invisible - Calico because he is out of range, Breg because he did not wish the spell to affect him. He notices Troll covertly casting a spell. "Please inform me if you are going to cast spells on me," he says. "Please stop talking and telling people that I'm casting spells," Troll replies. Lionel prepares to attack if he is attacked. Violet waits. Rowaine and Harley head in, becoming visible as they move away from Troll. Harley yelps, then sinks into the ground. "Rowaine, what happened?" Lionel thinks. "What happened to the paladin?" Breg adds, audibly. "Harley was hurt by something on the ground, so she sunk straight into it," Rowaine thinks. "I'm going in." "Something hurt the stone wolf," Lionel whispers. "Don't go in just yet." Calico cannot see any magic. He flies from the left side of the cave mouth to the right, becoming visible, looking for anything that could have hurt Harley. He sees that several of the stalagmites show a bit of wear and tear around their surfaces, as if they have been worked with tools. He cannot see anything that would obviously cause injury. He casts Superior Resistance upon himself. The figure moves back and towards the right-hand wall, in front of a lit brazier that emits a dull red glow as it burns. Breg moves behind where Harley was and tries to see what hurt the beast. He sees that the entire entranceway around the stalagmites is covered in three-inch spikes rising out of the stone. They are very hard to see. "Be careful!" he says. "There are spikes along this line!" Troll conveys this information to Rowaine. "How badly hurt is Harley?" Troll asks Rowaine telepathically. "Painful enough," Rowaine replies. "She is glad she didn't put more than one paw on, or she would be limping." Troll takes a couple of steps forwards and waits. Lionel shoots an arrow at the wall adjacent to the figure. The arrow shatters against the stone; the figure hisses and looks outwards, ferally. "Hold your fire!" Breg shouts. "We do not know that this is an enemy!" The creature hisses again. "Dare you! Dare you! Kill her. Kill me!" "I apologise for my companion's actions," Breg says. "I do not intend you harm." Lionel then moves forwards. Violet guesses she can fly between the stalagmites. She commands her carpet forwards over the first of the stalagmites casting Stoneskin on herself. She sees Rowaine and Harley emerge from the cavern floor ahead, against the left-hand wall. "Sshh!" Rowaine hisses. "It's evil. Very evil." Calico flies up to the right of the cavern mouth, lands on a stalagmites, then casts Stone Shape, morphing a 10' wide by 5' deep area of suspect floor into smooth stone. The creature makes a beeline towards Rowaine and Harley, then unleashes an open-handed uppercut at the mounted paladin. Troll notices that Rowaine does not immediately retaliate. The attack hits Rowaine heavily, rocking her in her saddle. "Aah, it is cold, it is COLD!" Rowaine cries. The creature then says, "Encased in a crystal prison without a door, but only the first: there are five more!" Breg says, "OK, ranger, you can kill it now!" He moves into the cavern and casts Recitation. Troll moves inside and casts Fiery Burst, engulfing the creature in flames. Total 29 damage, DC24 rfl save for half. The figure dodges with superhuman speed and escapes unscathed! Lionel shoots three arrows. AC39 hits for 15+2 damage, AC28 misses, AC34 hits for 11+3 damage. Both hits appear to cause less injury than Lionel was expecting. Violet Calls Lightning: 3d6=11 damage, reflex save vs DC18 for half. The creature cannot avoid the bolt but does not react when it hits! Harley smitebites but misses. Rowaine FullAttacks with Divine Might, the first also being a smite. The first hits for 27 damage, the second hits for 19 damage, the third misses. Each of the hits is mitigated. Calico casts Blinding Spittle and hits: the creature is blind! It turns into a translucent cloud and wafts backwards. "It could be ethereal!" Breg warns. "Troll, may I cast a Magic Circle of Protection against Evil on you?" Troll agrees and Breg does so. He then moves four squares into the cavern. End of round… The battle continues next week!